We are pleased to introduce to your our dedicated Choir Director, Mr. Willi Zwozdesky. Willi Zwozdesky is widely-known as a choral conductor and for his work as an arranger, which join together to form a large part of an active musical career that also includes music publishing and arts management. A native of Alberta, Zwozdesky later moved to Seattle, where he completed a Master of Music in choral conducting and a Master of Arts in music theory at the University of Washington in 1981. Following his move to Vancouver in that year, he established himself as a leader in the city’s cultural community, working in choral music, education, musical theatre, and most notably, as the conductor of the Vancouver Men’s Chorus, a position he still holds today. Since 2005, he has also served as Executive Director of the British Columbia Choral Federation, a province-wide choral service organization. He came to his work at Holy Trinity Ukrainian Orthodox Cathedral in March, 2010. 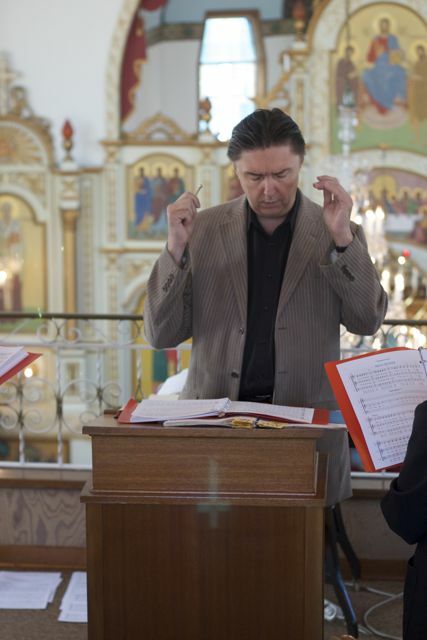 A life-long choral professional, Zwozdesky has worked in the Ukrainian choral and dance communities since 1973. Chief among his early influences in choral conducting were Volodymyr Kolesnyk, Abraham Kaplan, Eric Ericson, and Roman Soltykevych, from whom he took over the reins of the S.U.M.K. Choir at St. John’s Ukrainian Orthodox Cathedral in Edmonton while still an undergraduate. In addition to his musical pursuits, he also trained in arts management at The Banff Centre School of Management and at Simon Fraser University in Vancouver. At the core of Zwozdesky’s career are his choral arrangements, many of which regularly appear in concert programs and recordings across Canada and abroad. His choral music has been performed by leading choirs, including the Vancouver Chamber Choir, Pro Coro Canada, Elektra Women’s Choir, the Seattle Men’s Chorus, Turtle Creek Chorale, MUSE – Cincinnati’s Women’s Choir, Pandora’s Vox, and Chor Leoni Men’s Choir. His most recent commissions include an extended suite of traditional and original Ukrainian New Year carols for the Ukrainian Male Chorus of Edmonton. Since beginning his work at Holy Trinity, he has created a number of new original and arranged works for the cathedral choir, providing new music for the church on a regular basis. In 1990 he established Rhythmic Trident Music Publishing, which focuses on his own and others’ new Canadian works. An active choral clinician and adjudicator, Willi has also volunteered on a number of national and regional organizations, including the Canadian Music Centre, GALA Choruses, the World of Children’s Choirs 2001, and the Association of Canadian Choral Communities (present). In 2004, his dedication to choral music was recognized with both a Legacy Award from GALA Choruses and a Willan Award from the British Columbia Choral Federation.